Sorry the page is a bit late, got distracted by my bday yesterday and a crazy heatwave. Thankfully I have this weekend at home, so next page will be up in a few days. Thanks to folks who stopped by last weekend in Boise! I’ll be a guest at Rose City Comic Con next weekend in Portland at table D-01, so please feel free to say hi :] If you’ve got a book you’d like signed please feel free to bring it and I’ll get that for you. The Meek continues to be nominated for an Ignatz, and you continue to be invited to vote to for it at SPX if you are attending, and if you are so inclined :] And of course thank you for reading… last weekend I did a panel about webcomics, and it reminded me once again that the only reason I continue to make these comics for you all is for the love of it. I know you guys are here reading still because you share the same kind of passion, and I couldn’t do it without you. Happy Birthday!! belatedly of course–hope you had a great day! Greetings Ms. H and thanks so much for sharing your awesomely awesome comics for free. I’m more of a “physical” comics reader but some webcomics are just too sweet to pass. And The Meek sure caught my eye. I’m planning to pick up the book version by the way (if and when it gets published in Spanish…). I started reading it pretty recently so, I guess like a lot other people, blazed through the start until I soon got to the anxiously-waiting part. I say it’s a bit tough waiting to get back to where we left off in any character’s part of the story; it takes 2/3 of the time (which from what I’ve heard can take years!). So I’m curious about something: I’d like to know (if you’re willing to tell, of course) if you’re planning to bring Angora and Soli together in the same storyline, before the inevitable conclusion that is. At that point it’d be 1/1, jumping back at forth (or back and back) between them & Luca. It’s gonna be a lot less tough for us readers at least (if that’s how it’s gonna go). Oh, and happy birthday! And yes, generally speaking, all of these storylines will merge into one storyline eventually, but I can’t tell you any specific details~ It’s all one big interconnected story. Thanks for your answer! Even without going into specifics, you give some cred to my hopes! That’s great (but I think I my curiosity’s grown even more). Aand there’s the prophecy/riddle about A Woman Who Cries But Sheds No Tears, which could be Soli. This also has me hoping she’ll end up joining the party, like Pinter did. as someone who grew up in america with a non-native english speaking parent, this page really rings true to me. rana trying to speak pasori (‘m assuming) and switching to her more comfortable first language, even though she clearly understands her dad, is a really familiar, and ends up saying a lot about the dynamics between her and her father. i usually continue speaking to my mom in her language even when i make mistakes bc i feel like she won’t judge me for them. but i’m angry or want to express myself as clearly as possible or feel more vulnerable i will switch to english, even though that is me putting my ability to communicate over my mom’s. though from checking the wiki it says luca learned santri and carissi from a young age, so it seems that he is exerting more power in this interaction. so the fact that rana makes that change, from my point of view, says just as much about her strained relationship with luca as it does her mixed cultural/ethnic background. It’s easier to understand than to speak the language. If two people have similar level in the others language, speaking the others language may be more polite, but speaking their language makes more precise communication. That’s interesting, thanks for sharing. I studied linguistics a little – enough to remember that it’s called code-switching or diglossia. It’s an interesting subject. In more informal or less emotionally charged conversation, bilingual people will change language on the fly to whichever is better at expressing the subject they’re talking about. It can happen without them even realising they’re doing it. Which can be awkward if there’s a third person who doesn’t share that language in the conversation. 1 – Happy Heatwave Birfday!!! 2 – Unlike probably everyone else… I feel some sympathy for Luca. he’s clearly gone some level of crazy and can no longer deal with things as a sane adult. It’s probably safer for his kids if they start raising themselves at this point… preferably far, far away from him. And some part of Luca /knows/ this, even if he cannot or will not address it. On a scale of 1 to 10, how disappointed is he that she doesn’t have the best grasp of their traditional language? Phe probably managed this stuff in the bg prior to this and now he’s like ?????? problems ??? She looks so much like her mother in panel 4! Maybe it’s that classic “are you kidding me” look that Phe nailed down? Also, poor Luca. The ceiling’s really starting to come down on him, huh? Sigh. I thought about it while I was drawing and decided to switch her arms intentionally to imply fidgeting. I know it’s fun to assume I’m stupid about everything but it’s also insulting sometimes, esp since we were in the chat and I explained that I was aware. Please don’t automatically think I’m making a dumb mistake. What’s with some people’s nagging at the artist like (s)he’s their employee? I’m following a good number of webcomics and it seems like a kool guyz general trend. You may have the bestest of the stories, breathtaking lighting, great characters, awesome drawing skills and still you’ll have people complaining about (what they perceive as) a misplaced pixel. It was about a different panel in the chat. I was out of line, i appologize. @il biggo, i’m pretty sure i’m not “kool”. I’m truly fine with anyone asking about or pointing out mistakes, because I definitely make them, but the tone/ chastising “tsk” is not okay. I’m not interested in being treated like a child. I apologize for the tone of the message, it was out of line for me. I do not consider you to be stupid, making mistakes to be funny, or mirroring issues (which this I now understand was not) to be dumb. It’s not the first time a person, whose abilities I have no doubts in, reply telling I calI thed them stupid, so I should definitely try to be more aware of how i come off as. Thanks for the apology! The comic is where I get to escape from people being hyper-critical of everything I do (regular-critical is always fine tho). The massive irrelevance and pointlessness of this “criticism” leaves me speechless. Except: Keep on doing what you doing, because it’s great. Also a Matilda II tank justifies any number of continuity “errors”. Which this isn’t, anyway. It makes me happy that the reason Rana came to see him is her little sister, and she came in guns blazing. She’s not complaining about Hyla; she’s expressing concern for her. As much as Hyla annoys her and she resents the idea that Hyla might be her responsibility now, Rana recognizes that the little girl is suffering. Rana and Suda are of an age that they can get by without a parent, but Hyla is not. Contrary to Luca’s comment, Rana is taking the initiative and trying to help the situation, by getting Hyla what she needs most right now, an engaged parent. The difference between Rana and Luca here is she knows it’s not a situation to be “fixed.” It’s telling that he is “confused” by this. And that he is comfortable admitting it to Rana. I think he respects and trusts her in a way he does not Suda. 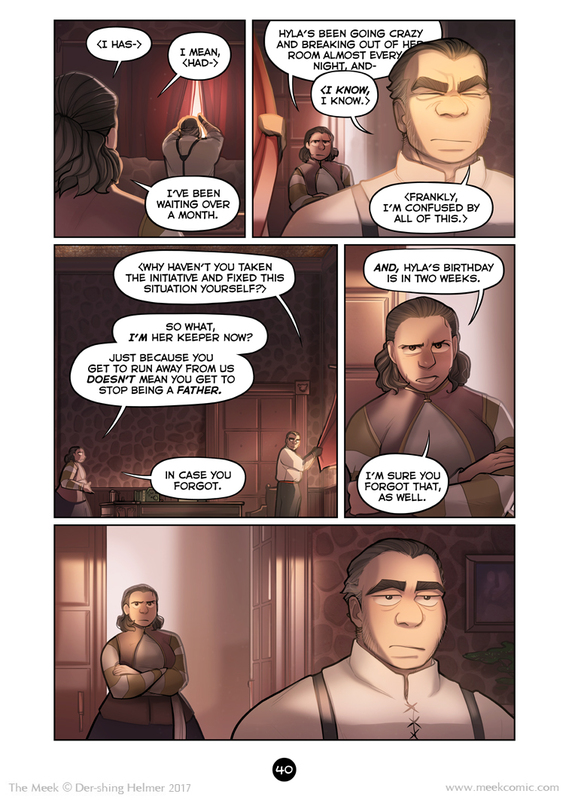 I am especially glad that Rana knows how much Hyla *needs* her father to make something of her birthday and is going to make sure he does the right thing. With the loss of Phe, Rana might be the only person able to stand up to Luca. She might be afraid of him at times, but where she feels she’s right – as here – she’s solid. Rana isn’t the most personable character in this world, but I have a feeling she one of its best hopes. Damn this hits home. I mean my dad wasn’t a king or speaking to a crazy diety of chaos but I definitely know how Rana is feeling.